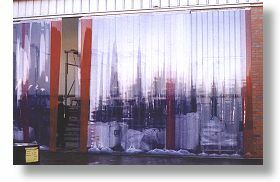 Flexible PVC strip curtains provide an easy and cost effective method of reducing heat loss or retaining chilled air in areas where control of the environment is important. The most popular and versatile hanging system available. Manufactured from heavy gauge stainless steel, which comprises a universal face or underside fixing hook-on angle section and stainless steel clamp plates which are riveted to the top of each PVC strip. The unique wide hook design helps keep the strips in place and also means that there is no requirement for any costly locking system. Supporting steelwork is also available when there is no lintel to fix to and/or when the curtains are being fixed in conjunction with other industrial doors, i.e. roller shutter doors or sectional overhead doors. The strips can be overlapped to create any of the patterns below, to suit differing traffic and weather conditions, and can easily be removed in better weather when more ventilation is required and then moved back into position when more insulation is required. The PVC strips have rounded edges making them pedestrian friendly and once hung, only require minimal maintenance. Just an occasional clean with a detergent solution removes any dirt or grime and returns the strips to their original clarity. 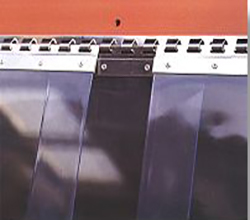 The unique raised ribbing on both sides of the PVC strip face gives greater durability and improved strength, thus enabling the PVC to withstand repeated impact from heavy traffic such as forklift trucks. The ribbed material increases the energy saving properties of the PVC strip by giving an interlocking effect when the strips are overlapped, and also helps prevent scratching of the PVC face, therefore retaining the clarity of the PVC longer. The ribbed material is compatible with most types of strip curtain suspension systems and is most commonly used with the stainless steel 'hook-on' system. Welding grade PVC strips screen out all of the hazardous UV and near UV rays associated with welding. The welding grade material has all the qualities of the standard grade, except that the colour and light transmission properties have been altered for welding applications. 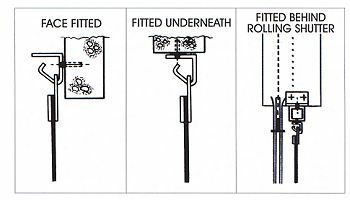 Sparks generated during welding will not ignite as the PVC does not support combustion, and due to its thickness sparks will not burn through, they simply deflect away. Polar grade material remains flexible at temperatures as low as -40ºC which makes the material ideal for use in cold stores, cold rooms and temperature controlled transportation, indeed anywhere that conservation of cold air is important. The polar grade PVC strip is available in both flat and ribbed extrusion. The exact structural opening width and height. Fitting to the underside or face of a lintel, if there is no lintel existing we can supply supporting steelwork upon request. Locations of the curtains, i.e., internal or external and whether the curtains will be subject to wind pressures. The type of traffic that is using the opening, i.e., pedestrians, fork lift trucks, etc. The environment that the curtains are going into, i.e., warehouse, coldroom, behind an industrial doorway, etc. If you require a sliding curtain, please specify how you would like the curtain to slide, i.e., all-to-one side, bi-parting, etc. A colour leaflet is available for this product on request.